A new free educational web resource will be launching online in two weeks. 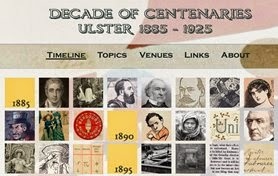 The Decade of Centenaries Timeline will provide an illustrated timeline of events from Ulster’s history from 1885-1925. It was commissioned by Community Relations Council NI to reflect its Remembering the Future – A Decade of Anniversaries initiative. An introduction and demonstration of the new site, together with talks about researching and using archive material, will be presented at the Public Records Office of Northern Ireland, Titanic Boulevard, Belfast, on Friday 20 June, 2pm to 4:30pm. The event is free but booking is essential. To register, send an email to info@digitalkey.biz by Monday 16 June.